We have a very diverse and talented group that we are privileged to work with. Our presenters range in age from the twenties to the eighties. When these presenters embody the poems, speaking them out loud, all the feelings, moods, and images in the poems become present in the room. It is pure magic. leads chanting groups all over the world. He worked in the theatre for many years, including 12 years as prop master for the SF Opera. He also creates and installs the colorful, inspired sets for The Great Night of Soul Poetry. Visit Doug's website at http://www.dougvonkoss.com . is the author of Ten Poems to Open Your Heart, Ten Poems to Change Your Life, and other popular poetry compilations. was a Berkeley school teacher for many years. 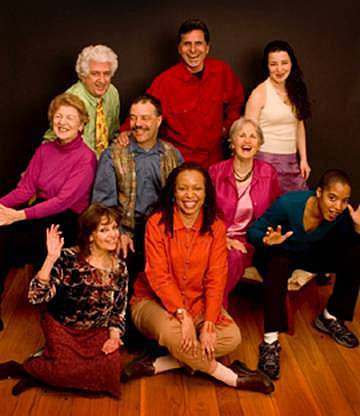 She has been a story teller for Stagebridge, the elder acting group. works with women in Afghanistan and people touched by the tragedy of 9/11. is a longtime Bay Area actress who was in the original Berkeley Shakespeare Company. sings with Bobby McFerrin's Voicestra and is the vocalist on The Breeze at Dawn: Poems of Rumi in song. is a an exquisite poet in her native Vietnamese language. is an opera singer who works with Goat Hall Productions and other Bay Area groups. is a dancer, ritualist and peace activist. sings everything from R&B to the jazz standards. is an accomplished story teller who has performed nationally. is the past mayor of Sebastopol and serves currently on its City Council. He is a member of the Green Party. is a film maker and an actor. He was the male lead in Proof at The Masquers in Point Richmond. We love music of all kinds so we have world class musicians like Sheldon Brown on woodwinds, Arshad Seyed on tabla, Claude Palmer on oud and electric bass and Sharon Walters on accordion. These musicians improvise music that fits perfectly with the poetry. How they do it I don't know, but they always do. The music adds so much.